How multicellular organisms respond to and are impacted by severe hypothermic stress is largely unknown. 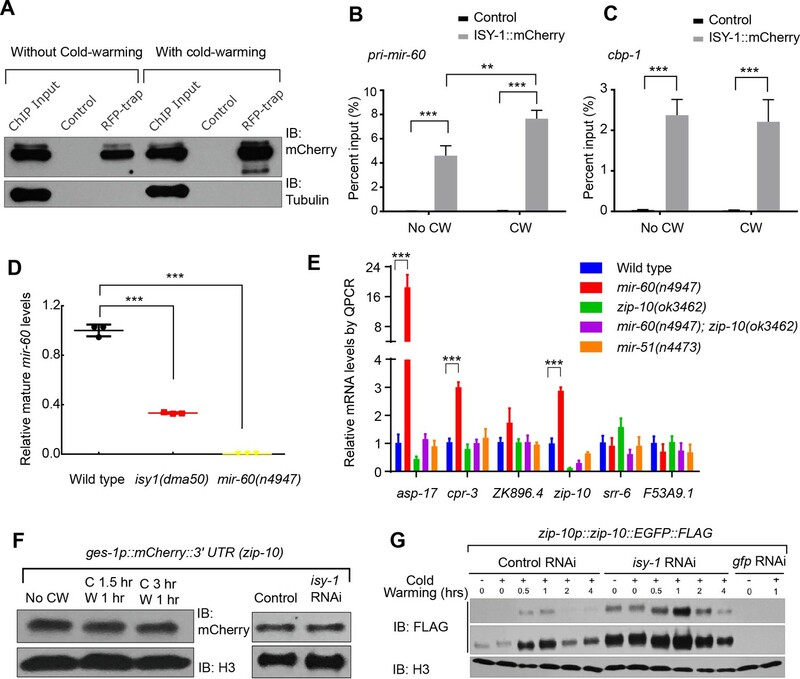 From C. elegans screens for mutants abnormally responding to cold-warming stimuli, we identify a molecular genetic pathway comprising ISY-1, a conserved uncharacterized protein, and ZIP-10, a bZIP-type transcription factor. ISY-1 gatekeeps the ZIP-10 transcriptional program by regulating the microRNA mir-60. Downstream of ISY-1 and mir-60, zip-10 levels rapidly and specifically increase upon transient cold-warming exposure. Prolonged zip-10 up-regulation induces several protease-encoding genes and promotes stress-induced organismic death, or phenoptosis, of C. elegans. zip-10 deficiency confers enhanced resistance to prolonged cold-warming stress, more prominently in adults than larvae. We conclude that the ZIP-10 genetic program mediates cold-warming response and may have evolved to promote wild-population kin selection under resource-limiting and thermal stress conditions. Life on earth faces constant changes in temperature. Most warm-blooded animals like humans can maintain a fairly stable body temperature, but cold-blooded animals can experience drastic shifts in body temperature. For example, the body temperature of the worm Caenorhabditis elegans can vary greatly depending on its surroundings. This species has evolved an exquisite set of temperature-sensing machineries that can react even to subtle fluctuations, which enables the worm to adjust its behaviour. However, drastic shifts in temperature can cause significant changes within the organism. Transient exposure to heat can activate genes that help cells to repair damaged proteins, while cold shock can influence the production of proteins in the cell. Although C. elegans can tolerate short periods of stress, an extended exposure to extreme temperatures can kill the worm. Until now, it was not known how C. elegans responds to cold shock followed by warmer temperatures, also referred to as cold-warming. To address this question, Jiang et al. created random mutations in C. elegans and isolated the worms that responded to cold-warming differently. The results revealed a molecular pathway that turns on genes in response to cold-warming. Jiang et al. found that two genes and their proteins, ISY-1 and ZIP-10, control which other genes are switched on or off in response to this temperature change. When the worms were exposed to cold-warming over a long period, the pathway remained active and many of the worms died, in particular older animals. These findings suggest that this genetic program might have evolved to help younger animals survive better when stress conditions are high and food resources limited. More work is needed to explore this new pathway and its implication in the heat-cold shock mechanisms. The affected genes are often the same across different organisms and can therefore be engineered to benefit research and medical applications in unexpected ways. For example, patients suffering a heart attack or brain injury are exposed to colder temperature to prevent the risk of tissue injuries once the blood flow goes back to normal. Therefore, the findings of this study may help us to understand how human cells respond to and are protected by low temperature. Temperature shifts pervasively affect numerous biological processes in all organisms. Heat shock stimuli activate expression of many heat-shock inducible genes through the sigma-32 factor and the evolutionarily conserved transcription factor HSF (Heat Shock Factor) in bacteria and eukaryotes, respectively (Gomez-Pastor et al., 2018; Yura et al., 1993). Coordinated expression of heat shock-induced chaperone proteins facilitates cellular proteostasis and adaptation to temperature upshift (Mahat et al., 2016; Solís et al., 2016). In contrast to heat shock response, how organisms respond to cold shock is still largely unknown (Al-Fageeh and Smales, 2006; Choi et al., 2012; Yenari and Han, 2012; Zhu, 2016). Although extensive RNA expression profiling studies have identified many protein-coding genes and non-coding RNAs that are regulated by cold shock via both transcriptional and post-transcriptional mechanisms (Al-Fageeh and Smales, 2006; Giuliodori et al., 2010; Kandror et al., 2004; Zhou et al., 2017), master regulators of cold shock response and cold-regulated genes (counterparts of HSF) have long been elusive and mechanisms of cold shock response in multicellular organisms remain poorly characterized. At the organismic level, warm-blooded mammals normally keep body temperature at about 37°C and initiate multiple homeostatic mechanisms to maintain body temperature upon exposure to hypothermia (Bautista, 2015; Morrison, 2016; Tansey and Johnson, 2015; Vriens et al., 2014). In humans, therapeutic hypothermia (32–34°C) has been widely used to treat ischemic disorders and proposed to activate multifaceted cellular programs to protect against ischemic damages (Choi et al., 2012; Polderman, 2009; Yenari and Han, 2012). By contrast, cold-blooded animals including most invertebrates experience varying body temperature depending on the environment, but can nonetheless elicit stereotypic behavioral, physiological and transcriptional response to chronic hypothermia or transient cold shock (Al-Fageeh and Smales, 2006; Garrity et al., 2010). Like many other types of stress, prolonged severe hypothermia can lead to the death of organisms, in most cases likely because of failure in adapting to the stress, or alternatively through stress-induced phenoptosis, namely genetically programed organismic death (Longo et al., 2005; Skulachev, 1999; 2002). Although phenoptosis has been phenotypically documented in many cases, its evolutionary significance and genetic mechanisms remain unclear and debated (Longo et al., 2005; Sapolsky, 2004). We previously discovered a C. elegans genetic pathway that maintains cell membrane fluidity by regulating lipid desaturation in response to moderate hypothermia (10–15°C) (Fan and Evans, 2015; Ma et al., 2015). Expression of the gene fat-7, which encodes a lipid desaturase, is transcriptionally induced by 10–15°C but not by more severe hypothermia (i.e. cold shock at 0–4°C), which impairs C. elegans reproduction and growth, and elicits distinct physiological and behavioral responses (Garrity et al., 2010; Lyons et al., 1975; Ma et al., 2015; Murray et al., 2007). However, as severe hypothermia arrests most of cell biological processes, strong transcriptional responses to cold shock e.g. 0–4°C likely only manifest during the organismic recovery to normal ambient temperature. We thus hypothesize that a genetic pathway differing from that operating under moderate hypothermia exposure controls the transcriptional response to severe hypothermia/cold shock followed by warming in C. elegans. In this work, we performed transcriptome profiling to first identify genes that are regulated by exposure to cold shock followed by recovery at normal temperature. We then used GFP-based transcriptional reporters in large-scale forward genetic screens to identify a genetic pathway consisting of isy-1 and zip-10, the latter of which responds to cold-warming (CW) and mediates transcriptional responses to CW. Unexpectedly, we found strong zip-10 induction promotes organismal death while deficiency of zip-10 confers resistance to prolonged CW stress, more prominently in adults than young larvae. We propose that CW activates a ZIP-10 dependent genetic program favoring C. elegans phenoptosis and postulate that such programmed organismic death may have evolved to promote wild-population kin selection under thermal stress conditions. To identify new mechanisms of C. elegans response to severe hypothermia, we performed RNA sequencing (RNA-seq) of wild-type C. elegans populations after 2 hrs exposure to 4°C cold shock followed by recovery at 20°C for 1 hr. We used such CW conditions in an attempt to identify genes that specifically and rapidly respond to CW rather than those that respond to general organismic deterioration after long cold exposure. After differential expression analyses of triplicate samples, we identified 604 genes that are significantly up- or down-regulated by such CW conditions (Figure 1—source data 1, Figure 1A and Figure 1—figure supplement 1A). Gene ontology analysis indicates that the CW-regulated genes are involved in biological processes including lipid metabolisms, autophagy, proteostasis and cell signaling (Figure 1—figure supplement 1B). We generated transgenic C. elegans strains in which GFP is driven by promoters of the top-ranked CW-inducible genes. In this work, we focus on asp-17 as a robust CW-inducible reporter gene owing to its low baseline expression level and high-fold induction by CW, features that permitted facile isolation of full-penetrance mutants after random mutagenesis (see below) with both abnormal asp-17p::GFP expression and altered organismic tolerance to prolonged cold stress. asp-17 is robustly and specifically induced by cold-warming. (A) Volcano plot of RNA-seq showing differentially regulated genes (up-regulated genes in red; down-regulated genes in green; asp-17 was indicated by purple dot) by cold-warming in wild type C. elegans. (B) RNA-seq reads at the asp-17 locus showing consistent up-regulation of asp-17 transcript levels in triplicate samples after cold-warming. (C) QPCR measurements of gene expression levels showing up-regulation of three representative CW inducible genes, including asp-17, after shifting from 25°C to different degrees of hypothermia (4°C, 10°C, 15°C and 22°C) lasting 2 hrs followed by recovery at 25°C for 0.5 hr. (D) Quantification of RNA-seq reads indicating specific up-regulation of asp-17 but not other members of the asp family genes (only expressed asp genes are shown). (E) QPCR measurements of asp-17 levels under conditions of indicated durations of cold and warming (with or without 25°C recovery for ‘yes/no’). (F) smFISH images showing asp-17 up-regulation (signals indicated by yellow) by CW predominantly in the intestine of wild type but not asp-17 null animals. n ≥ 20 total animals for each group with N ≥ 3 independent biological replicates; *** indicates p<0.001. Scale bar: 50 µm. C. elegans asp-17 encodes an aspartyl-like protease with unknown molecular functions. 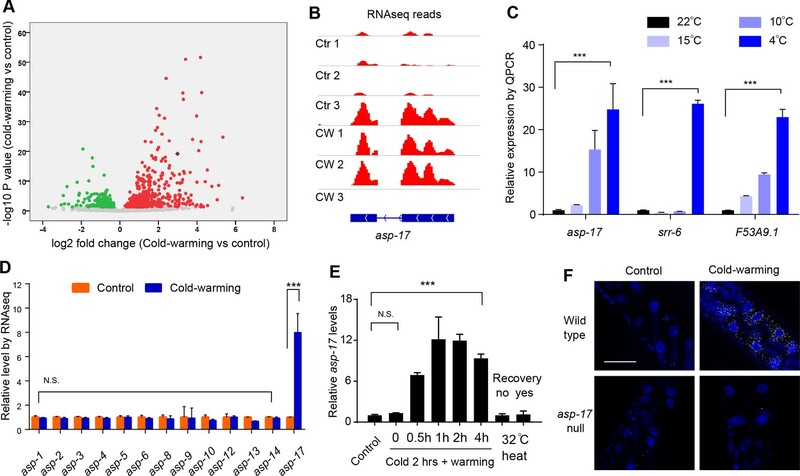 Like other CW-inducible genes, asp-17 up-regulation is more prominently induced by severe than moderate hypothermia followed by recovery from cold shock (Figure 1B and C). Among the aspartyl-like protease family members, we found that only asp-17 was robustly and specifically induced by CW (Figure 1D). The up-regulation of endogenous asp-17 by CW can be recapitulated by an integrated GFP reporter driven by the endogenous asp-17 promoter, indicating transcriptional regulation of asp-17 by CW (Figure 2—figure supplement 1A). We varied CW treatment conditions and found that the induction of asp-17 strictly required the warming phase after cold shock (Figure 1E). However, heat shock at 32°C did not increase asp-17 expression (Figure 1E), consistent with previous large-scale transcriptome profiling studies in C. elegans (Brunquell et al., 2016). Single-molecule fluorescent in situ hybridization (smFISH) identified the CW-induced asp-17 predominantly in intestinal cells (Figure 1F). Since CW activates numerous other genes in addition to asp-17, we sought to use asp-17p::GFP as a robust readout reporter to identify the upstream genetic pathway and transcriptional regulators that control asp-17 induction by CW. We performed a forward genetic screen using EMS-induced random mutagenesis of a parental strain carrying a genome-integrated asp-17p::GFP reporter and isolated over 30 mutants with constitutive asp-17p::GFP expression in the absence of CW (Figure 2—figure supplement 1B and C). We molecularly cloned one mutant dma50 that exhibited fully penetrant and constitutively strong expression of asp-17p::GFP (Figure 2A,B and Figure 2—figure supplement 1D–1F). Compared with wild type, dma50 strongly up-regulated asp-17::GFP in the intestine (Figure 2B). By single nucleotide polymorphism (SNP)-based linkage analysis of the intestinal asp-17p::GFP phenotype, we mapped dma50 to a genetic interval on Chromosome V and used whole-genome sequencing to identify candidate causal gene mutations (Figure 2—figure supplement 1D,E). 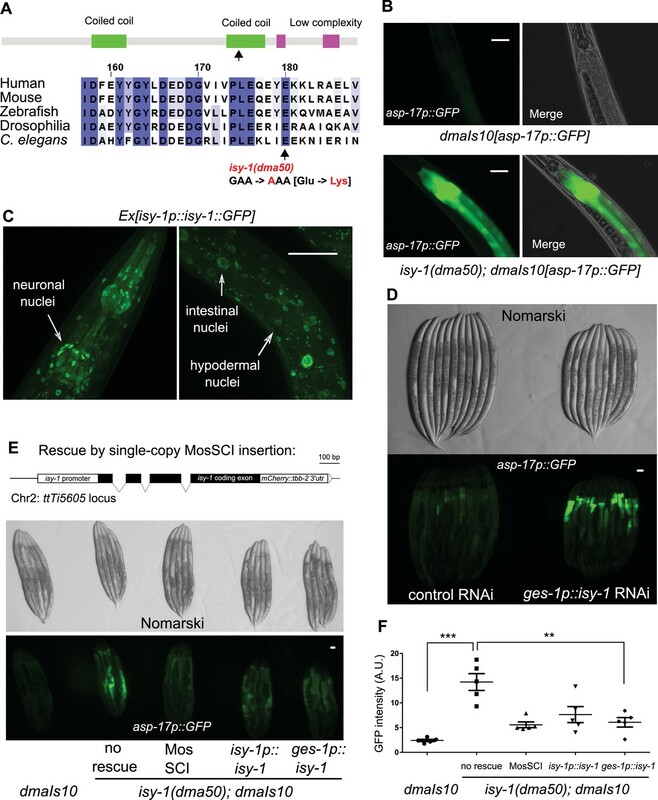 Based on phenocopying by feeding RNAi against the candidate genes and transformation rescue of the asp-17p::GFP phenotype, dma50 defines a previously uncharacterized C. elegans gene isy-1 (Figure 2A–F and Figure 2—figure supplement 1F). isy-1 (Interactor of SYF1 in yeast) encodes a protein with strong sequence similarity to an evolutionarily highly conserved family of RNA-binding proteins in eukaryotes (Figure 2A and Figure 2—figure supplement 2A–C) (Dix et al., 1999; Du et al., 2015). dma50 caused substitution of a negatively charged glutamate, which is completely conserved in the ISY protein family, to a positively charged lysine in the predicted coiled-coil region of C. elegans ISY-1 (Figure 2A). An isy-1p::isy-1::GFP translational reporter indicated a rather ubiquitous distribution of ISY-1::GFP in many tissues including intestinal nuclei (Figure 2C). The strong intestinal asp-17p::GFP expression caused by dma50 was fully rescued by transgenic expression of wild-type isy-1(+), single-copy integration of a mCherry-tagged isy-1(+) allele, or isy-1(+) expression driven by the intestine-specific ges-1 promoter (Figure 2E and F). In addition, the ges-1-driven transgenic expression of sense plus antisense isy-1 RNAi fully recapitulated the dma50 phenotype (Figure 2D). Endogenous expression of asp-17 was also drastically up-regulated in isy-1 mutants (Figure 2—figure supplement 2D). Thus, these results identify isy-1 as a causal cell-autonomous regulator of asp-17. A forward genetic screen identifies C. elegans isy-1 as a causal regulator of asp-17::GFP expression. (A) Schematic of the C. elegans ISY-1 protein showing the domain structure predicted by SMART (top) (http://smart.embl-heidelberg.de) and a multiple sequence alignment of ISY-1 homologues from major metazoans showing the conservation of the glutamate residue substituted to lysine by the dma50 mutation isolated from EMS screens. (B) Nomarski and fluorescence images showing the phenotype of intestinal asp-17p::GFP in wild type and dma50 mutants. (C) Fluorescence images showing the distribution of ISY-1::GFP driven by the endogenous isy-1 promoter. Arrows indicate neuronal, hypodermal and intestinal nuclei. (D) Nomarski and fluorescence images showing intestinal asp-17p::GFP in a transgenic strain expressing RNAi against isy-1 specifically in intestine. (E) Schematic of the C. elegans isy-1 gene with mCherry tagged at the C-terminus (top); Nomarski and fluorescence images showing rescue of dma50 by various transgenes (below). (F) Quantification of fluorescence intensities showing rescue of dma50 in asp-17p::GFP activation. N ≥ 3 independent biological replicates; *** indicates p<0.001. Scale bar: 20 µm. Human ISY1 is critical for certain microRNA processing while yeast ISY1 is a likely component of the spliceosome (Dix et al., 1999; Du et al., 2015; Galej et al., 2016). We found that CW-induced asp-17 up-regulation was further enhanced in isy-1 mutants compared with wild type (Figure 3A), suggesting that ISY-1 normally restricts transcriptional activity of asp-17. To determine the mechanism by which ISY-1 regulates transcription of asp-17, we sought to identify transcription factors (TF) that meet two criteria: a), its mRNA or protein products are altered in isy-1 mutants, and b), it is genetically epistatic to isy-1, that is, its loss-of-function (LOF) can suppress isy-1 LOF (thus also likely required for asp-17 induction by CW). We performed RNA-seq from triplicate samples of wild-type hermaphrodites and isy-1 mutants, from which we analyzed differentially expressed TF-encoding genes in isy-1 mutants and found that a bZIP-type transcription factor-encoding gene zip-10 met both criteria (Figure 3B, Figure 3—source data 1). zip-10 mRNA was drastically up-regulated in isy-1 mutants, whereas levels of closely related bZIP family genes, such as zip-11, were unaffected (Figure 3C). Importantly, genetic deletion of zip-10 completely abrogated the ability of isy-1 RNAi to activate asp-17p::GFP (Figure 3D). These results indicate that ISY-1 regulates asp-17 by controlling the level of zip-10 mRNAs. ZIP-10 acts downstream of ISY-1 and mediates transcriptional response to CW. (A) QPCR measurements of asp-17 levels induced by CW in wild type and isy-1(dma50) mutants. (B) Volcano plot of RNA-seq showing differentially regulated genes (up-regulated genes in red; down-regulated genes in green) in isy-1 mutants compared with wild type. (C) RNA-seq measurements of expression levels for indicated genes in wild type and isy-1(dma50) mutants. (D) Nomarski and fluorescence images showing asp-17p::GFP induction by isy-1 RNAi was blocked in zip-10 mutants. (E) Western blots of the integrated zip-10p::zip-10::EGFP::FLAG strain showing time-dependent protein induction by CW. (F) Western blots of the integrated zip-10p::zip-10::EGFP::FLAG strain showing its up-regulation by isy-1 RNAi and down-regulation by GFP or zip-10 RNAi. Both short- and long-exposure blots are shown. (G) Western blots of the integrated zip-10p::zip-10::EGFP::FLAG strain showing its up-regulation strictly required warming after cold shock. (H) Western blots of the integrated zip-10p::zip-10::EGFP::FLAG strain showing its up-regulation by CW was further enhanced by isy-1 RNAi. (I) QPCR measurements of gene expression levels showing ZIP-10 dependent up-regulation of asp-17 and cpr-3 but not srr-6 or F53B9.1 after cold for indicated durations and 1 hr warming. n ≥ 20 total animals for each group with N ≥ 3 independent biological replicates; *** indicates p<0.001. Scale bar: 20 µm. Next, we examined how the ISY-1/ZIP-10/ASP-17 pathway is regulated by CW. CW did not apparently alter levels of endogenous isy-1 mRNAs or mCherry-tagged ISY-1 proteins under the endogenous isy-1 promoter (Figure 2—figure supplement 2D and E). By contrast, we found that CW induced drastic up-regulation of ZIP-10 proteins from a tagged zip-10p::zip-10::EGFP::FLAG allele in an integrated transgenic strain (Figure 3E). Although EGFP fluorescence was invisible in animals carrying such transgenes (likely because it is sandwiched by zip-10 and FLAG), the striking induction of ZIP-10::EGFP::FLAG was completely blocked by RNAi against zip-10 or GFP, confirming the transgene specificity (Figure 3F). The baseline level of ZIP-10::EGFP::FLAG was close to the detection limit of western blot under normal conditions, but nonetheless is strongly up-regulated upon RNAi against isy-1 (Figure 3F). Similar to that of asp-17, the induction of zip-10p::zip-10::EGFP::FLAG strictly required the warming phase of CW and occurred rapidly but transiently after warming during CW (Figure 3G). CW strongly up-regulated asp-17 expression in both wild type and isy-1 mutants, which exhibited abnormally high zip-10 mRNA levels (Figure 3H). Furthermore, zip-10 deletion completely abrogated the up-regulation of asp-17 levels by CW (Figure 3I). We also examined the ZIP-10 dependency of other CW-inducible genes identified by RNA-seq and found that at least cpr-3 also required ZIP-10, but other CW-inducible genes including srr-6 and F53A9.1, did not (Figure 3I). These results demonstrate that ISY-1 suppresses asp-17 by decreasing zip-10 levels whereas CW up-regulates ZIP-10 protein abundance to promote asp-17 expression. How is zip-10 regulated by ISY-1 and CW? Loss of ISY-1 function affected neither general intron splicing, based on an intronic GFP reporter assay, nor specific splicing of zip-10, although both CW and isy-1 mutations strongly up-regulated zip-10 mRNA levels (Figure 3—figure supplement 1A–1E). We constructed a GFP transcriptional reporter driven by the endogenous zip-10 promoter and found it was markedly up-regulated by isy-1 RNAi (Figure 3—figure supplement 2A). While non-thermal stresses such as hypoxia and starvation did not increase ZIP-10 levels, CW drastically increased abundance of ZIP-10 in both cytosol and nucleus without affecting abundance of other house-keeping proteins, including HSP90, tubulin and histone H3 (Figure 3—figure supplement 2B and C). CW up-regulation of ZIP-10 required warming and was enhanced by more prolonged cold shock (Figure 3—figure supplement 2D). Since CW can markedly increase zip-10 mRNA levels but to a lesser extent than the isy-1 mutation (Figure 3—figure supplement 1D and E), we tested whether ZIP-10 proteins might be regulated by CW through translational control and mRNA stability. RNAi against genes encoding eIF5 and a component of the Ccr4-Not complex did not apparently alter ZIP-10 levels (Figure 3—figure supplement 2E). Together, these results indicate that CW and ISY-1 regulate zip-10 primarily at the transcriptional level. Human ISY1 facilitates the processing of primary transcripts encoding certain families of microRNAs (Du et al., 2015). Both zip-10 and asp-17 are up-regulated in a mutant C. elegans strain deficient in the microRNA mir-60 (Kato et al., 2016). We thus tested whether mir-60 mediates the regulation of zip-10 by ISY-1. Immunoprecipitation of mCherry-tagged ISY-1 followed by quantitative PCR (QPCR) revealed specific binding of primary transcripts encoding mir-60 as well as a protein-coding gene cebp-1 (Figure 4A–4C). Although neither isy-1 nor mir-60 levels were affected by CW, we found CW slightly increased mir-60 binding to ISY-1, perhaps as a feedback mechanism to limit over-activation of zip-10-dependent genes after CW treatment (Figure 4B). Importantly, mature mir-60 levels were drastically decreased in isy-1 mutants while loss of mir-60 led to up-regulation of zip-10 and zip-10-dependent subset of CW-inducible genes, including asp-17 and cpr-3, but not many other CW-inducible genes (Figure 4D and E and Supplementary file 1). The 3’ untranslated region (Utr) of zip-10 appeared not to be regulated by CW or isy-1 RNAi (Figure 4F). However, isy-1 RNAi caused an abnormally high baseline level of ZIP-10 in the absence of CW and enabled further heightened ZIP-10 up-regulation in response to CW, followed by its down-regulation over an extended period of warming (Figure 4G). These results indicate that CW regulates transcription of zip-10 (and thereby that of asp-17), while ISY-1 controls expression of zip-10 via mir-60, likely through microRNA processing and regulation of additional upstream transcriptional zip-10 regulators that respond to CW. ISY-1 regulates zip-10 via mir-60. (A) Western blot of mCherry/RFP-trapped RNA immunoprecipitates in animals treated with or without cold-warming. (B) QPCR measurements of the percent input for primary mir-60 transcripts from mCherry/RFP-trapped RNA immunoprecipitates in animals treated with or without cold-warming. (C) QPCR measurements of the percent input for cbp-1 transcripts from mCherry/RFP-trapped RNA immunoprecipitates in animals treated with or without cold-warming. (D) QPCR measurements of the mature mir-60 transcript levels from wild type, isy-1(dma50) and mir-60(n4947) deletion mutants. (E) QPCR measurements of the levels of CW-inducible gene transcripts in animals with indicated genotypes and conditions. (F) Western blot of lysates from animals carrying the array ges-1p::mCherry::3’utr(zip-10) reporters with CW or isy-1 RNAi. No change of reporter activity was observed. (G) Western blot of lysates from animals carrying zip-10p::zip-10::EGFP::FLAG reporters with various indicated CW and RNAi conditions. n ≥ 20 total animals for each group with N ≥ 3 independent biological replicates; *** indicates p<0.001; ** indicates p<0.01. We compared the genes differentially regulated by CW and those by isy-1(dma50) mutants and found 246 genes, including the two ZIP-10-dependent targets asp-17 and cpr-3, that are commonly regulated by both conditions (Figure 5A, Figure 5—source data 1). Global transcriptome changes between these two conditions are also significantly correlated (Figure 5B) (correlation coefficient R as 0.54, significance P value as 0). We used the bioinformatics tool MEME (Bailey et al., 2009) to identify motifs present in the promoters (~600 bp upstream of transcription start sites) of the commonly regulated gene subset and identified a single enriched motif characterized by AT-rich sequences (Figure 5C). The gene most enriched with this motif is asp-17, the promoter of which contains 16 such motifs (Figure 5C). ZIP-10 is a bZIP-type transcription factor predicted to contain N-terminal low sequence-complexity domains and a C-terminal DNA-binding and glutamine-rich transactivation domain (Figure 3—figure supplement 2F–H). To test whether the asp-17 promoter with the identified AT-rich motifs can be bound directly by ZIP-10, we performed chromatin immunoprecipitation (ChIP) experiments and detected asp-17 promoter sequences in the FLAG-tagged ZIP-10 chromatin complex only under CW conditions (Figure 5D). These results indicate that ZIP-10 directly binds to and activates the asp-17 promoter in the genetic program regulated by ISY-1 and CW. ISY-1 and ZIP-10 regulate a genetic program to promote organismic death. (A) Venn diagram indicating numbers of genes commonly regulated by CW and isy-1(dma50) mutants. (B) Scatter plot depicting the correlation between the transcriptome response to cold (y-axis) and the transcriptome response to isy-1 mutation (x-axis). Shown are the log2 fold changes compared with corresponding controls. Pearson correlation coefficient and the associated P-value were calculated using R functions. (C) AT-rich motif identified by MEME enriched among the CW and isy-1(dma50) regulated genes, with a table listing numbers of the motif present in top-ranked four genes. (D) ChIP-QPCR measurements of ZIP-10::FLAG binding to the asp-17 promoter. (E) Survival rates of indicated genotypes after prolonged CW (4°C for 48 hrs followed by 4 hrs of warming). (F) Organismic death rates of indicated genotypes after heat shock (32°C) induction of zip-10 wild type, mutant with defective transactivation C-terminus, zip-2 and zip-11 (left), without CW. Nomarski image (right) indicates morphologies of normal and dead animals with induction of zip-10. (G) RNA-seq measurements of gene targets of indicated TFs. (H) Table showing the asp-17p::GFP and cold tolerance phenotypes of animals with indicated genotypes. (I) Model for the role and regulation of the ZIP-10 pathway. n ≥ 20 total animals for each group with N ≥ 3 independent biological replicates; *** indicates p<0.001. The striking regulation of zip-10 and asp-17 by CW and ISY-1 prompted us to examine the organismic phenotype of various mutants upon prolonged CW stress. A majority of wild-type C. elegans adults died upon prolonged CW stress (e.g. 2–4°C for over 24 hrs) (Ohta et al., 2014). We found that asp-17 or zip-10 loss-of-function mutants exhibited markedly higher survival rates than wild type under the same prolonged CW stress condition (Figure 5E). Consistent with a role of wild-type zip-10 in promoting organismic death, inducible zip-10 over-expression by mild transient heat shock, mediated by the hsp-16 promoter, promoted animal death even in the absence of CW (Figure 5F). By contrast, other ectopically induced zip genes including zip-11 and zip-2 did not affect animal death, while a mutation specifically disrupting the glutamine-rich transactivation domain of ZIP-10 abolished the death-promoting effect (Figure 5F and Figure 3—figure supplement 2H). Although zip-10 is genetically epistatic to isy-1 in the regulation of asp-17, we found that isy-1 mutants are also markedly resistant to prolonged cold stress. This paradox was resolved after we observed that many downstream target genes of the stress-coping transcription factors HIF-1, HSF-1 and DAF-16 are up-regulated in isy-1 mutants, and LOF of at least daf-16 could partly suppress cold tolerance by isy-1 RNAi (Figure 5G and H). Since ISY-1 regulates zip-10 via mir-60 (Figure 4) supporting a role of ISY-1 in specific microRNA processing (Du et al., 2015), we performed small RNA library sequencing of wild type animals and isy-1 mutants and identified specific members of microRNAs that were differentially regulated, including mir-60 and additional microRNAs predicted to target stress-coping TFs (Figure 5—figure supplement 1A–F). Thus, isy-1 mutants likely exhibit pleiotropic phenotypes caused by abnormal activation of multiple TFs in addition to ZIP-10. In contrast to ZIP-10 dependent genes (asp-17 and cpr-3), the HIF-1/HSF-1/DAF-16 target genes were not apparently induced by CW (Figure 1—source data 1). Furthermore, unlike HSF-1 or DAF-16 that are induced by other types of stress stimuli, ZIP-10 is more strongly induced by CW in adults than in larvae (Figure 5—figure supplement 2C), suggesting phenoptosis-promoting effects of zip-10 more specifically for adults. Indeed, the phenotypic difference in cold tolerance between wild type animals and zip-10 mutants manifested more prominently in developmentally more mature-stage and older animals (Figure 5—figure supplement 2D). These results indicate that CW specifically activates a ZIP-10-driven and developmental stage-modulated transcriptional genetic program to promote the organismic death, or phenoptosis, of C. elegans (Figure 5I). From a genetic screen for C. elegans mutants with altered transcriptional response to CW, we identified isy-1 and subsequently discovered the CW and ISY-1-regulated transcription factor ZIP-10 as a key mediator of the transcriptional response to CW. A thermal stress-responding TF might be expected to promote adaptation of animals towards the stressor, causing its LOF mutants to be sensitive to the stress. Unexpectedly, we found zip-10 mutants are markedly resistant to prolonged cold stress. However, unlike other stress-responding TFs that activate genes largely beneficial for physiological homeostasis and thus animal health under stress conditions (Baird et al., 2014; Dempersmier et al., 2015; Hwang and Lee, 2011; Kandror et al., 2004; Kumsta et al., 2017; Landis and Murphy, 2010), identified transcriptional targets of ZIP-10 include at least two Cathepsin-type proteases, CPR-3 and ASP-17 (Figure 4E). In contrast to aspartyl-type proteases which are largely unknown in cellular functions, caspase-type proteases are well-known apoptotic cell death executioners while CPR-4, a Cathepsin CPR-3 paralogue, has been shown to inhibit cell deaths in C. elegans (Metzstein et al., 1998; Peng et al., 2017; Peter, 2011). Ectopic expression of zip-10 and its targets promotes organismic deaths, in contrast to the effect of zip-10 or asp-17 deficiency on cold tolerance (Figure 5E and F). As duration of cold shock affects levels of ZIP-10 and transient CW does not trigger phenoptosis, the pro-death role of the zip-10 genetic program likely depends on multiple factors, including the duration and severity of cold exposure. Notably, apoptotic cell death-promoting effects have also been described for specific members of mammalian bZIP TFs (Chüeh et al., 2017; Hartman et al., 2004; Ritchie et al., 2009). The specific and robust induction of ZIP-10 by CW, the opposing cold-tolerance phenotypes caused by zip-10 loss-of-function and gain-of-function genetic manipulations, as well as the pro-death roles of ZIP-10 targets support the notion that the zip-10 pathway is activated by severe CW to promote phenoptosis. How do ISY-1 and CW regulate the zip-10 pathway? We found that the zip-10 promoter activity responds to the loss of ISY-1, which normally maintains mir-60 levels and thereby regulates zip-10 transcription likely through the processing of small RNAs. Severe cold stress also leads to accumulation of another class of small RNA risiRNA, which is important for maintaining rRNA homeostasis (Zhou et al., 2017). Whether ISY-1 might also affect risiRNA processing remains to be characterized. Constitutive up-regulation of ZIP-10 targets in isy-1 mutants and the lack of evidence for regulation of ISY-1 by CW supports ISY-1 as a gate-keeper for the ZIP-10-driven transcriptional response to CW (Figure 5I). Regulation of zip-10 is primarily transcriptional based on evidence we present in this study; further studies are required to discern to what extent mir-60 might directly act at the zip-10 locus or more indirectly impact the transcription of zip-10, e.g. by post-transcriptionally inhibiting translation of a transcriptional activator. 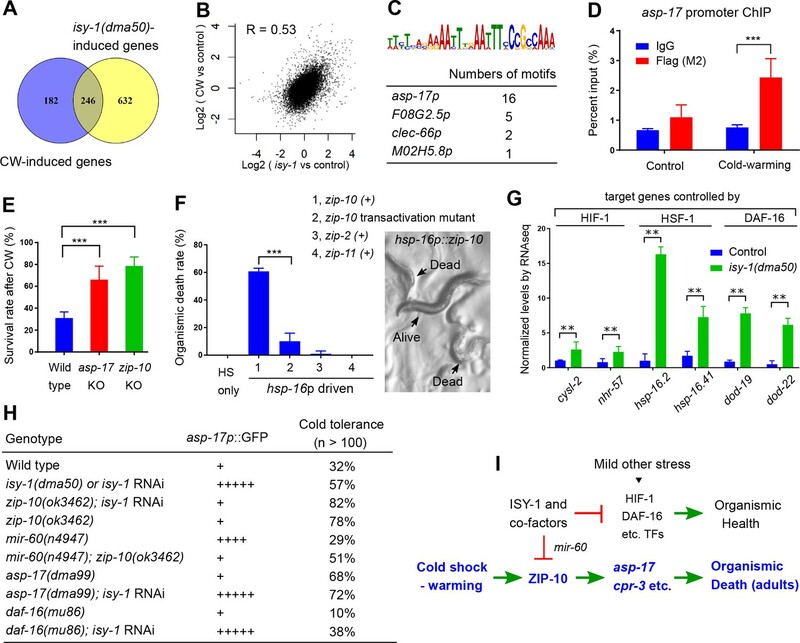 Up-regulation of the activity of the zip-10 promoter by CW indicates that additional cold-responding sensors and effectors upstream of ZIP-10 remain to be identified, by signaling mechanisms perhaps similar to the well-characterized cold-responding pathways found in other organisms (Dempersmier et al., 2015; Kandror et al., 2004; Zhu, 2016). Precisely how zip-10 is regulated by CW in coordination with ISY-1 to promote C. elegans death under prolonged CW stress awaits further investigation. The roles of ZIP-10 and a dedicated genetic program in promoting organismic death are surprising but would make sense in light of the evolutionary kin selection theory. Kin selection refers to the evolutionary process promoting the reproductive success of an organism's kin despite a cost to the organism's own reproduction (Hamilton, 1963; Smith, 1964). Dedicated genetic programs may have evolved to promote kin selection at the population level. Although the concept and potential mechanisms of programed organismic death, or phenoptosis, are debated, examples of kin selection and stress-induced organismic deterioration have been widely documented in many organisms (Longo et al., 2005; Sapolsky, 2004; Skulachev, 1999; 2002). Laboratory conditions for hermaphroditic C. elegans clearly no longer exert selection pressure for genetic programs underlying phenoptosis or kin selection. However, our mathematic modeling of an exemplar situation of population growth for wild-type and zip-10 deficient animals under food-limiting and CW stress conditions supports the phenoptosis or kin selection hypothesis for the zip-10 pathway (Figure 5—figure supplement 2A and B). Experimentally, we found that both the CW-induced zip-10 expression and the death-promoting effect of ZIP-10 occurred more prominently in older adults than in larvae (Figure 5—figure supplement 2C and D). Extending from the kin selection theory, we postulate that the evolutionary advantage of programmed organismic death might manifest in the wild, where resources for growth and reproduction are limited and environments can change drastically. As such, the selective death of adult animals would benefit young and reproductively more privileged populations to facilitate the spreading of genes by young populations under resource-limiting and high-stress conditions. Our work provides an unprecedented example of stress-induced phenoptosis in C. elegans and identify a specific transcription factor in a genetic program that likely evolved to promote kin selection during animal evolution. These findings therefore bear broad implications for understanding thermal stress response, programmed organismic death (phenoptosis) and evolutionary biology. C. elegans strains were maintained with standard procedures unless otherwise specified. The N2 Bristol strain was used as the reference wild type, and the polymorphic Hawaiian strain CB4856 was used for genetic linkage mapping and SNP analysis (Brenner, 1974; Davis et al., 2005). Forward genetic screen for constitutive asp-17p::GFP reporter-activating mutants after ethyl methanesulfonate (EMS)-induced random mutagenesis was performed as described previously (Ma et al., 2012; 2015). Single-copy integration of isy-1p::isy-1::mCherry transgene was generated using the MosSCI method (Frøkjaer-Jensen et al., 2008). To generate asp-17 null alleles in C. elegans, we used CRISPR-Cas9 to induce double-stranded breaks and subsequent non-homologous end joining caused a deletion of asp-17. Feeding RNAi was performed as previously described (Kamath and Ahringer, 2003). Transgenic strains were generated by germline transformation as described (Mello et al., 1991). Transgenic constructs were co-injected (at 10–50 ng/μl) with dominant unc-54p::mCherry or rol-6 markers, and stable extrachromosomal lines of mCherry+ or roller animals were established. Genotypes of strains used are as follows: daf-16(mu86) I, mir-60(n4947) II; isy-1(dma50) V, zip-10(ok3462) V, asp-17(dma99) V, dmaIs10[asp-17p::GFP; unc-54p::mCherry] X, dmaIs21[zip-10p::GFP; unc-54p::mCherry]; wgIs634[zip-10p::zip-10::EGFP::FLAG + unc-119(+)], oxTi302 [eft-3p::mCherry::tbb-2 3'UTR + Cbr-unc-119(+)], dmaSi1[isy-1p::isy-1::mCherry, unc-119(+)], dmaEx95[ges-1p::isy-1(+); rol-6(+)], dmaEx99[isy-1 genomic DNA (2 ng/ul); rol-6(+)], nEx102[ges-1p::isy-1(+); rol-6(+)], nEx103[ges-1p::isy-1(+); rol-6(+)], dmaEx104[ges-1p::mCherry::3utr(zip-10), rol-6(+)], dmaEx123[hsp-16p::zip-10; rol-6(+)], dmaEx124[hsp-16p::zip-10; rol-6(+)], dmaEx131[zip-10p::GFP; unc-54p::mCherry]. Control N2 animals and the isy-1 mutants were maintained at 20°C. For cold stress, N2 animals were exposed to 4°C for 2 hrs followed by 1 hr recovery at 20°C. Upon sample collection, the animals were washed down from NGM plates using M9 solution and subjected to RNA extraction using the RNeasy Mini Kit from Qiagen. 1 µg total RNA from each sample was used for sequencing library construction. Each treatment included three biological replicates. The NEBNext rRNA Depletion Kit was used for rRNA depletion. After rRNA depletion, the Agencourt RNAClean XP Beads from Beckman Coulter were used for RNA purification. Then, the NEBNext Ultra Directional RNA Library Prep Kit for Illumina was used for RNA fragmentation, first strand and second strand cDNA synthesis and double-stranded cDNA end repair. Double strand cDNAs were purified using the Agencourt AMPure XP from Beckman Coulter and ligated to adaptors of the NEBNext Multiplex Oligos for Illumina. Finally, the Q5 Hot Start HiFi PCR Master Mix was used for PCR enrichment of the adaptor-ligated DNA. The concentration and quality of the constructed sequencing libraries were measured by using the Agilent High Sensitivity DNA Kit and a Bioanalyzer 2100 from Agilent Technologies. The libraries were submitted to 100 bp paired-end high throughput sequencing using Hiseq-3000 by the Center for Advanced Technology (CAT) of the University of California, San Francisco. RNA-seq data analysis was performed using a super computer system equipped with multiple processors. The raw reads were trimmed and filtered by the prinseq-lite software (0.20.4) (Schmieder and Edwards, 2011). Reads longer than 30 bp and with a minimum quality score higher than 15 were kept and used for subsequent analyses. The filtered left and right read sets were compared by the Pairfq script to separate paired and single reads. The clean reads were mapped to the C. elegans genome sequence using Hisat2 (2.0.5)(Kim et al., 2015) with default parameters. The number of mapped reads were counted by featureCounts from the Subread package (1.5.0) (Liao et al., 2014). Differential gene expression analysis was performed using the DESeq2 package (Love et al., 2014). Adjusted p-value≤0.05 was used as the threshold to identify the differentially expressed genes. Gene ontology and KEGG pathway enrichment analyses for the differentially expressed genes were conducted using the Cytoscape plugins BiNGO (Maere et al., 2005) and ClueGO (Bindea et al., 2009), respectively. Plots for the mapped reads were generated by IGVtools (Thorvaldsdóttir et al., 2013). 50 µl pellet animals were resuspended in 250 µl lysis buffer of Quick-RNA MiniPrep kit (Zymo Research, R1055) then lysed by TissueRuptor (Motor unit ‘8’ for 1 min). Total RNA was extracted following the instruction (Zymo Research, R1055). 2 µg RNA/sample was reverse transcribed into cDNA (BioTools, B24408). Real-time PCR was performed by using Roche LightCycler96 (Roche, 05815916001) system and SYBR Green (Thermo Fisher Scientific, FERK1081) as a dsDNA-specific binding dye. qRT-PCR condition was set to 95°C for denaturation, followed by 45 cycles of 10 s at 95°C, 10 s at 60°C, and 20 s at 72°C. Melting curve analysis was performed after the final cycle to examine the specificity of primers in each reaction. Relative mRNA was calculated by ∆∆CT method and normalized to actin. Primers for qRT-PCR: asp-17 (Forward, ATGTTCCGCTGACTGCGAAG; Reverse, TTTCATTCATTTCATCCCAC), F53A9.1, Forward, ACTACGGAAACGGAGGATAC; Reverse, TGGCCGTGATGATGATGATG), srr-6 (Forward, CTCCAAGTCCTGAAGTCGTG; Reverse, GTAGGGATGGATTGAACTCG), isy-1 (Forward, AGATGCTGAGCGATTCAGAC; Reverse, CTTTCGATAGTCCGTACCAC), zip-10 (Forward, TCGAGATGCTCTTCAACTG; Reverse, CTAACTGCTTGCCGGAG), cpr-3 (Forward, GTAGTGGAGCAGTAACAGGTG; Reverse, CAGTTTGAATTTCGGTGACGG), act-3 (Forward, TCCATCATGAAGTGCGACAT; Reverse, TAGATCCTCCGATCCAGACG). Transgenic (isy-1p::isy-1::mCherry and zip-10p::zip-10::EGFP::FLAG) animals were cold shocked (4°C) for 0, 1, 2 or 4 hrs, followed by recovery at 25°C for 1 hr. Animals were harvested and washed three times with M9 and 20 µl pellet animals were lysed directly in Laemmli Sample Buffer and used for western blot analysis. Proteins were resolved by 15% SDS-PAGE (Bio-Rad, 4561084) and transferred to a nitrocellulose membrane (Bio-Rad, 1620167). Proteins were detected using antibodies against Flag (Sigma, F3165), mCherry (M11217, Life Technologies), Tubulin (Sigma, T5168), H3 (Abcam, ab1791) or HSP90 (Proteintech, 13171–1-AP). For subcellular fractionation, 50 µl pellet animals were resuspended in 150 µl 1 X cell lysis buffer (Cell Signaling Technology, 9803S) with protease inhibitor cocktail (BioTools, B14002) and 10 µM PMSF, and incubated for 10 min on ice. Animals were lysed by TissueRuptor (Qiagen, 9001271) with Motor unit ‘6’ for 30 s on ice. After incubation on ice for 5 min and centrifugation at 5,000 rpm at 4°C for 2 min, the supernatant was collected as the cytoplasmic part. The nuclear pellet was washed three times with lysis buffer and resuspended in 150 µl RIPA buffer (Thermo Fisher Scientific, P89900) for 30 min on ice, spun at 12,000 rpm for 15 min, and the supernatant was collected as nuclear extract. Tubulin and H3 were separately used as cytoplasm and nuclear loading control. For RNAi experiments, zip-10p::zip-10::EGFP::FLAG animals were bleached, and the eggs were laid onto RNAi plates. Animals were harvested as L4/young adults and subject to western blot analysis as described above. ChIP-QPCR assay was carried out as before with modifications. Briefly, CW-treated animals (4°C for 4 hrs, recovered at 25°C for 1 hr) and control (25°C) animals were harvested and washed by 1 X PBS. The pellet animals were resuspended in cross-linking buffer (1% formaldehyde in 1 X PBS) followed by homogenization using TissueRuptor with Motor unit ‘4’ for 1 min at room temperature. The process was then stopped by addition of glycine (125 mM final concentration). After washing and discarding the supernatant, the pellet was resuspended in lysis buffer and lysed by TissueRuptor with Motor unit ‘6’ for 1 min on ice, with lysate kept on ice for additional 3 min, and then repeated three times. The lysate was centrifuged to collect the supernatant and one percent of the aliquot was used as ‘Input’. Lysate was precleared by adding salmon sperm DNA/protein-A agarose beads (Bioworld, 20182011–1), rotating at 4°C for 1 hr. After centrifugation, supernatant was divided equally and added with 50 µg Flag antibody (Sigma, F3165) and mouse IgG (Santa Cruz Biotechnology, sc-2025), respectively. The samples were incubated and rotated overnight at 4°C. Next, salmon sperm DNA/protein-A agarose beads were added for 2 hrs at 4°C. The beads-antibody-TF-DNA complex was washed extensively and the complex and input were diluted with proteinase K buffer. The samples were then incubated at 55°C for 4 hrs and then at 65°C overnight to reverse crosslink. DNA was extracted by phenol-chloroform-isoamylalcohol (Sigma-Aldrich, 77617). asp-17 promoter was measured by QPCR and calculated by the percent input method. Primers for ChIP-QPCR: asp-17 promoter (Forward, TTCGCTGCACCTATATGTTG; Reverse, CCGCTAATACCCTTATCAC). RNA immunoprecipitation (RIP)-QPCR assay was carried out as before with modifications to accommodate our reagents (Kershner and Kimble, 2010). Briefly, synchronous day-1 isy-1p::isy-1::mcherry animals were divided into two groups. One group is control (25°C) and the other is cold-warming (4°C for 4 hrs, recovered at 25°C for 1 hr). Animals were harvested and washed by M9 buffer until the supernatant was clear, and then washed once in buffer A and twice in lysis buffer. About 250 μl worm pellets were frozen in liquid nitrogen twice and homogenized using TissueRuptor with Motor unit ‘4’ for 1 min on ice. The lysate was kept on ice for 15 min and centrifuged to collect the supernatant and 1% of the aliquot was kept as ‘Input’. Equal amount of supernatant was added with RFP-Trap_MA (Chromotek) and rotated for 4 hrs at 4°C. IP magnetic agarose beads were washed and 10% of IP beads were boiled for 6 min in 2X Laemmli Sample Buffer. RNA was eluted from remaining beads using 200 μl lysis buffer of Quick-RNA MiniPrepkit (Zymo Research, R1055) and extracted following the instruction. RNA was quantified with a Nanodrop device. 500 ng RNA was reverse transcribed into cDNA and quantified by the percent input method. Primers for RIP-qPCR: Primary mir-60 Forward TCGAAAACCGCTTGTTCTTG, Reverse CGATTTCTCAAGTCTTGAACTAG; cebp-1 Forward GATCCTTCGCAAGACAAGAC, Reverse CACATTGTCGGTAGGAACGTC. Animals were cultured under non-starved conditions for at least 4 generations at 25°C before cold tolerance assay. For cold tolerance assay of L1-stage animals, bleach-synchronized populations were kept at 4°C for 96 hrs and then recovered for 4 hrs at 25°C. For cold tolerance assay of adults, animals were raised at 25°C from hatching with excessive bacteria food on agar plates. Well-fed L4 stage animals were transferred to new plates and kept at 25°C overnight to reach day-1 adulthood. To cold shock the animals, agar plates were spread with equal distance on a thin plastic board and transferred to a constant 4°C cold room for 48 hrs or the indicated duration. After cold shock, animals were then moved to 25°C for recovery for 4 hrs before scoring survival rates. Animals were scored as dead if they showed no pumping and movement upon light touch with the body necrosis subsequently confirmed. smFISH of C. elegans and imaging were performed as previously described (Ji and Oudenaarden, 2005). For fluorescence imaging, spinning-disc confocal and digital automated epifluorescence microscopes (EVOS, Life Technologies) were used to capture images of animals after RNAi or CW treatments. Synchronous population of worms were randomly picked and treated with 1 mM levamisole water solution to paralyze the animals. The animals were mounted on an agar pad on a slide and aligned for imaging. Identical conditions and settings were used for both control and test groups. For quantification of fluorescence images, the animals in the images were outlined and signals were quantified by ImageJ software. The intensity of an individual animal was obtained by dividing the total signal by the area of that animal. The average intensity of the control group was set to be 1.0, to which all other intensities were normalized. Graphpad Prism software was used to plot the data. For small RNA sequencing, total RNA was isolated by the Quick-RNA MiniPrep kit (Zymo Research, R1055) that yields total RNA including small RNAs ranging 17–200 nt. RNA samples extracted from triplicate N2 animals and isy-1 mutants were submitted to Beijing Genomics Institute for small RNA library construction and sequencing. The low-quality reads were filtered and clean reads were mapped to the C. elegans genome using Bowtie2 program (Langmead and Salzberg, 2012). MiRDeep2 (Friedländer et al., 2012) was used to characterize known and predict novel miRNAs. The small RNA expression level was calculated as TPM (transcript per million). Differentially expressed small RNAs were detected by DESeq2 (Love et al., 2014). The threshold for differentially expressed sRNAs was adjusted p-value≤0.05 and the absolute value of Log2ratio ≥1. Targets of miRNAs were predicted by TargetScan (Jan et al., 2011), RNAhybrid (Krüger and Rehmsmeier, 2006) and miRanda (John et al., 2004) using default parameters. Data were analyzed using GraphPad Prism Software (Graphpad, San Diego, CA) and presented as means ± S.D. unless otherwise specified with p values calculated by unpaired Student's t-tests, one-way or two-way ANOVA (comparisons across more than two groups) and adjusted with Bonferroni's corrections. Nature Reviews Molecular Cell Biology 19:4–19. Molecular and Cellular Biology 24:5721–5732. Single molecule fluorescent in situ hybridization (smFISH) of C. elegans worms and embryos, WormBook. Developmental dynamics : an official publication of the American Association of Anatomists 239:1405–1412. Cell Death & Differentiation 16:838–846. Annals of the New York Academy of Sciences 959:214–237. Advances in Physiology Education 39:139–148. Annual Review of Microbiology 47:321–350. Nature Structural & Molecular Biology 24:258–269. Thank you for submitting your work entitled "A Genetic Program Underlies Cold-warming Response and Promotes Phenoptosis" for consideration by eLife. Your article has been reviewed by three peer reviewers, and the evaluation has been overseen by a Reviewing Editor (Julie Ahringer) and a Senior Editor (Detlef Weigel). The following individuals involved in review of your submission have agreed to reveal their identity: Shouhong Guang (Reviewer #1); Meng C Wang (Reviewer #2); Ding Xue (Reviewer #3. Our decision has been reached after consultation between the reviewers. Based on these discussions and the individual reviews below, we regret to inform you that your work, at least in its current form, will not be considered further for publication in eLife. We appreciate both the general interest in the phenomenon you describe and the strengths of several of your experiments, with which you have made progress in understanding hypothermic stress and the cold-warming (CW) response, an important but little studied topic. At the same time, there was broad agreement that the study is not yet at a sufficient level for a general audience. In particular, the precise mechanism of isy-1 action is still unclear. Similar, it is not yet known whether the genes identified are specific to CW or alternatively act in other stress pathways. Additionally, an important paper by Kato et al., 2016 linking mir-61 to regulation of zip-10 and asp-17 appears to have been missed; work that is relevant to the mechanism of isy-1 and the specificity of the genes studied here. Our criticisms notwithstanding, we are very interested in the CW phenomenon. If you decide, based on the reviews, not to go immediately elsewhere with the work for publication, but rather to add more mechanistic detail before resubmitting it, we would encourage you to consider eLife again for such a future submission. If the reviewers' comments are appropriately addressed, we would very likely review such a new submission again and would try to consult the same reviewers. In the meantime, we hope that you find the reviewers' specific comments helpful. Altogether an interesting paper, with good data. It touches on important points, and I think it would be valuable to the community and would be relevant to anyone who is interested in hypothermic stress regulation. But some revisions must be made. Context is frequently omitted making this paper difficult to read. A longer format may be warranted to accommodate additional context and background. 1) asp-17 was chosen as a robust CW-inducible reporter gene to search for regulators and identified isy-1/zip-10 pathway. How general is this isy-1/zip-10 regulation? How many other genes use this mechanism to respond to CW induction and how many don't? In Figure 3I, F39A9.1 is responsive to CW but independent of zip-10, what is the mechanism of this regulation? And srr-6 exhibits a more pronounced upregulation to CW in zip-10 KO mutant. 2) Figure 4C, does cpr-3 contains similar ZIP-10-binding motif? A genome wide ChIP-seq of ZIP-10 with and without CW stress, and in isy-1(dma50) mutants will greatly increase the paper. 3) The Figure 4—figure supplement 1A-1F of microRNA deep sequencing is not involved in this paper at all, which can either be taken out or need more elaboration. Meanwhile, in the methods section, the deep-sequencing of small RNAs need elaboration. For example, did they use 5'-phosphate-dependent or independent method for sequencing? A recent paper showed that CW-induction (very similar to the treatment in this paper) elicits risiRNA expression, has this category of small RNAs been analyzed. 4) The Discussion section is very hard to read, both the length of sentences and the logic. 5) It is very interesting how CW induction upregulates zip-10 expression. Is there any molecular reasoning of this regulation? In the genetic screening, has the author tried to isolate mutants that failed to respond to CW stress induction, in addition to the constitutive asp-17::GFP expression mutants? 6) In Figure 1—figure supplement 1C, in unc-43 mutant, the expression of asp-17 is also decreased with and without CW stress. How about the relative change? And in TRPA-1 mutant, the upregulation of asp-17 is actually more pronounced. CW likely involves calcium signaling is an interesting observation, which may need further discussion or investigation. 7) In Figure 4B, there is a very good correlation between isy-1/control vs. CW/control. Does this mean CW actually directly regulates isy-1? In this manuscript, the authors have used C. elegans as an animal model to investigate the molecular mechanisms that organisms utilize to handle cold shock and sequent warm-up (cold-warm stress response). From candidate genes upregulated by cold-warm stress, the authors have identified asp-17, an aspartyl-like protease and generated its GFP reporters for an EMS mutagenesis screen. From the screen, the authors discovered an isy-1 mutant that leads to constitutive induction of asp-17 without cold-warm stress. isy-1 encodes a conserved RNA-binding protein and acts in intestinal cells to regulate asp-17 expression cell-autonomously. Furthermore, they discovered that the ZIP-10 transcription factor functions downstream of isy-1 and directly regulates asp-17 expression. Inactivation of zip-10 or asp-17 increases organism survival upon cold-warm stress, while inactivation of isy-1 also increases organism survival upon cold-warm stress. Overall, the manuscript addresses an interesting question that remains poorly understood and is well written. 1) In this study, the authors have used cold-shock and sequent warm-up as an experimental system to assay a cold-warm stress response. In this experimental set up, both phases, cold and warm, are important, and can have distinct molecular and physiological changes related to organism survival. In fact, as shown in Figure 3E and 3G, the protein levels of ZIP-10 show very different dynamics with different duration of cold shock and warm-up. It seems that ZIP-10 levels won't be induced without warm-up. Is this true? So which phase does zip-10 play a crucial role in regulating organism responses and survival? How about asp-17? The authors should consider characterizing the dynamic changes of zip-10 and asp-17 during cold shock and during warm-up. Also, the induction of zip-10 goes away with increasing warming time. Is isy-1 responsible for regulating this transient induction? In the isy-1 inactivated condition, will zip-10 levels stay on with increasing warming time? 2) asp-17 is induced by the isy-1 mutant without cold-warm stress, and this induction can be further enhanced by cold-warm stress (similar induction folds in both conditions, Figure 3A). It is likely that isy-1 just controls the asp-17 expression level in general. Then how about zip-10? Does isy-1 just control its levels in general, or more specific to cold-warm stress? 3) zip-10 is a transcription factor. The authors showed that it is transcriptionally induced upon cold-warm stress and increases its occupancy at the promoter of asp-17. Does this transcription factor regulate asp-17 cell-autonomously in intestinal cells? Where is this transcription factor localized in the cell, cytosol or nucleus? Does cold-warm stress affect its cellular localization? From the WB results shown in Figure 3—figure supplement 2, it is hard to tell. The authors should consider conducting immunostaining. 4) The authors showed that the isy-1 mutant is more resistant to cold-warm stress, which can be partially suppressed by daf-16. Does daf-16 affect the tolerance of the zip-10 mutant? Also, does HSF-1 affect the tolerance of the isy-1 mutant? 5) When comparing Figures 4E and 4F, it seems like that heat-shock pre-treatment increases tolerance to cold-warm stress (0% death rate vs. 65% death rate). Is this true? If yes, could this be the reason why the isy-1 mutant is more resistant, since hsp-16.2 and hsp-16.41 are induced in the isy-1 mutant. Hypothermia is a type of stress that might induce phenoptosis in severe conditions. This paper identifies a molecular pathway that regulates the cold-warming response in C. elegans. Following the "cold-warming" (CW) treatment, the authors did an RNA-Seq analysis to identify genes that are differentially expressed with or without CM. They identified asp-17, an aspartyl protease that was upregulated following CW treatment. To identify genes that regulate the expression of asp-17, they did an EMS mutagenesis and isolated a mutation in the isy-1 gene that constitutively up-regulates the transcriptional expression of asp-17 without CW treatment. To identify transcription factors that might be regulated by isy-1, they performed another RNA-Seq analysis using WT and isy-1 mutants and identified zip-10. Further experiments showed that isy-1 suppresses zip-10 expression, whereas CW upregulates zip-10 expression. They also suggest that zip-10 has a pro-death role important for kin selection in evolution. Their studies suggest that CW induces zip-10 upregulation and elevated death in older adults compared with larvae, thus supporting the theory of kin selection. This is a strong paper that reveals critical components involved in a poorly understood stress-response process. The experimental approach is straightforward, and the data are solid. The conclusions are supported by multiple independent experiments. The main drawback is the lack of mechanistic understanding of how ISY-1 regulates ZIP-10. I support the publication of this paper in eLife with appropriate revisions. 1) Figure 1B, align "Ctr" or "CW" labels with the data. Figure 1F: In the legends they mentioned 'signals indicated by red', which should be yellow. 2) Figure 4D, to show ZIP-10 binds directly to the asp-17 promoter, in vitro DNA binding assays need to be performed and ZIP-10 binding sites should be deleted as a negative control. 3) CPR-4 inhibits germ cell death, instead of promoting germ cell death (Discussion section). 4) Since CPR-3 is one of the ZIP-10 downstream targets and is another protease like ASP-17, the consequence of CPR-3 overexpression should be examined. The authors address hypothermic stress and the cold-warming (CW) response, an interesting but little studied topic. They have made progress by identifying a cascade of genes that regulate or are regulated by CW. This is a good start, but the mechanism of isy-1 action is still unknown and the specificity of the genes in CW is wasn't determined. The authors have missed an important paper that has linked mir-60 to regulation of asp-17 and zip-10 (Kato et al., 2016). Both genes are upregulated in mir-60 mutants and zip-10 is a strong candidate for being a direct target of mir-60 (the mRNA has several good predicted binding sites). Given that human ISY1 is involved in microRNA processing, a plausible model is that isy-1 mutants reduce expression of mir-60 (which is intestine specific), which leads to upregulation of ZIP-10, which then induces asp-17 expression. The authors need to take this previous work into account, both by discussing their results in light of this paper and by directly investigating the potential link with mir-60. If ISY-1 is involved in microRNA processing, then it is probably not specifically involved in CW. Instead it may non-specifically affect this process through processing of microRNAs. If so, loss of other factors that process microRNAs (e.g. dicer, drosha) would be expected to activate the asp-17 reporter. This and whether loss of isy-1 affects microRNA processing should be tested. Interestingly, Figure 4—figure supplement 1 shows that mir-60 is downregulated in isy-1 mutants. ZIP-10 has been previously linked to the innate immunity pathway, and its expression is upregulated upon exposure to bacterial pathogens (Shapira et al., 2006). BATF3, the human ortholog of ZIP-10, has also been linked to immune system regulation and response to pathogens. Is asp-17 upregulated upon exposure to pathogens? Liang et al., 2007 (not cited) showed that zip-10 is expressed in the intestine. What was the rational for focusing on zip-10? Other TFs are also upregulated in isy-1 mutants (jun-1, cebp-1, fos-1, zip-2, and others). Interestingly, zip-2 mediates response to Pseudomonas aeruginosa infection (Estes et al., 2010). The authors propose that ZIP-10 may promote organismal death. Could the authors test if it has such a role in pathogen infection? Thank you for resubmitting your work entitled "A Genetic Program Mediates Cold-warming Response and Promotes Phenoptosis in C. elegans" for further consideration at eLife. Your revised article has been favorably evaluated by Detlef Weigel (Senior editor), Julie Ahringer (a Reviewing editor) and three reviewers (Meng Wang, Shouhong Guang, and Ding Xue). 1) CW and ISY-1 regulate zip-10 predominantly at the transcriptional level. Because microRNAs can function in the cytoplasm to downregulate targeted mRNAs or inhibit translation, mir-60 may not directly prohibit the transcription of zip-10. It would be of interest to discuss this potential for post-transcriptional regulation in models of of ISY-1and mir-60 may regulate zip-10. 2) In the new Figures 4B-4C, have the numbers been normalized to the amount of immunoprecipitated proteins? 3) The legend of panels D & E are missing for Figure 3—figure supplement 1. 4) In Figure 4—figure supplement 1, experimental details and statistics are missing. Including the numbers of fold change in zip-10 mutant would be helpful. 5) For western-blotting of the proteins, the work used mixed-staged animals. Do ISY-1 and ZIP-10 exhibit stage-specific expression? A population of mixed-staged animals may contain different combination of the stages, which can complicate the explanation. 6) In the Materials and methods section, the RNeasy Mini Kit from Qiagen was used to purify total RNAs, which are usually longer than 200 nt. How small RNAs were isolated for library construction and deep sequencing needs clarification. Endogenous siRNAs were missed from the Figure 5—figure supplement 1, suggesting that the 5'-dependent method was used to sequence the small RNA library. 7) In Figure 4E, please use different colors to represent different bars. The p-values between zip-10 bars need to be shown. In addition, the relative mRNA level of zip-10 in zip-10(ok3462) is zero and the relative mRNA level of zip-10 in the mir-60; zip-10 double is around 1.5. These results are not consistent. Please explain. 8) Results section, third paragraph, Figure 2A should be Figure 2B. Thank you for the suggestion. We have resorted to a longer Research Article format, which we agree is more appropriate for accommodating additional context, background and new results needed to improve readability and address the comments and questions raised by the reviewers and editors. We agree this is an important question to address. To assess specificity of gene regulation mediated by ISY-1/ZIP-10, we have performed QPCR quantification of the expression levels of 17 genes (in addition to the 4 reported in the initial submission) randomly selected from the gene set commonly regulated by ISY-1 and CW. The results indicate striking specificity: only asp-17, cpr-3 and ZK896.4 strictly depend on ZIP-10 while the remaining set of genes are up-regulated by CW even in zip-10 mutants (new Figure 4—figure supplement 1). This indicates that ZIP-10 likely promotes a dedicated genetic program in response to CW, consistent with the induction of ZIP-10 specifically by CW stress (Figure 3—figure supplement 2B) and its mutant phenotype in CW adaptation (new Figure 5). Although identifying an exhaustive list of stringent ZIP-10 target genes will require additional RNAseq and tissue-specific ChIP experiments, we believe asp-17 is the major and physiologically relevant target since LOF phenotype of zip-10 is largely recapitulated by that of asp-17 (new Figure 5E). Investigating mechanisms of regulation of F39A9.1 and srr-6 is underway and the results will be described elsewhere given the focus/scope of this paper and the ZIP-10 independence of their regulation by CW. Although the cpr-3 promoter does not contain a canonical ZIP-10-binding AT-rich motif as predicted by the stringent criteria of the program (new Figure 5C), we manually checked the promoter sequence and note that it does contain conserved AT-rich motifs resembling the canonical ZIP-10 binding motif (e.g. agaatttttttaaattttcaacaaaa, at -441 nt of its transcriptional start site) that might allow binding of ZIP-10 at lower affinity or in combination with other contextual transcriptional binding partners. Since ZIP-10 seems to be exclusively present in intestine, whole-organism ChIP-seq of ZIP-10 would be limited in identifying additional relevant targets. We would like to focus on asp-17, the validated transcriptional target of ZIP-10 that confers major causal effects in CW responses (new Figure 5). Thank you for the suggestion. Given the note from the reviewing editor that mir-60 is downregulated in isy-1 mutants, we have confirmed the finding by QPCR and performed functional experiments to test causal involvement of mir-60. As suggested by the reviewing editor, we have explored the mechanistic connection of ISY-1 to mir-60 and found indeed ISY-1 binds directly to the primary transcript of mir-60, based on RNA immune-precipitation of mCherry-tagged ISY-1, followed by QPCR quantification (new Figure 4). Furthermore, mir-60 mutants exhibited elevated expression of asp-17 in a manner that requires zip-10, thus linking ISY-1 to ZIP-10 mechanism of regulation. Therefore, we’d like to keep the microRNA profiling result including that of mir-60, which is now more directly relevant for this paper. We did not distinguish the 5'-phosphate-dependent or independent methods or analyze risiRNA expression. Nonetheless, we performed new RNA immune-precipitation experiments and found that levels of mir-60 bound to ISY-1 were slightly but significantly increased by CW, consistent with enhanced processing of small RNA by ISY-1, e.g. mir-60 in particular as a feedback mechanism to curb overexpression and toxicity of ZIP-10 after CW. Although potential link from ISY-1 to risiRNA was not explored, the interesting result of CW regulation of risiRNA indicates a perhaps similar mechanism and function in organismic homeostatic control and now included in the paper for brief discussion. We have reorganized and rewritten the Discussion section to improve readability. Thank you for the comment. The up-regulation of zip-10 is indeed striking and very interesting from molecular mechanistic points of view. Our results indicate that zip-10 up-regulation by CW is largely mediated by transcriptional mechanisms, since GFP driven by the zip-10 promoter (zip-10p::GFP) was up-regulated by CW while its 3’utr was not (new Figure 4F). We have used EMS mutagenesis to isolate viable mutants with zip-10p::GFP that fail to respond to CW induction but unfortunately the penetrance of such mutants were generally too low (~5-20%) to be tractable for genetic mapping and molecular cloning. We reason that the upstream stress-responding regulators might be essential (precedents include genes e.g. skn-1) or genetically redundant (precedents include GPCRs) so that positive gene regulators of CW responses are harder to identify than negative gene regulators like isy-1. We agree with this reviewer that the baseline level of asp-17 is already low in unc-43 mutants and involvement of calcium signaling based on unc-43 and trpa-1 results alone is difficult to interpret. The relative change is not significant compared with wild type. Thus, we have removed this result in the revised manuscript to avoid any confusion. Thank you for pointing out this observation to clarify. Our results clearly indicate that CW does not directly regulate ISY-1 since endogenous isy-1 mRNA and mCherry-tagged proteins are not changed by CW (Figure 2—figure supplement 2). In our model, zip-10 up-regulation by CW and ISY-1 occurs likely in parallel pathways and is mediated largely by transcriptional mechanisms (based on zip-10p::GFP up-regulation). We clarified in the revised paper that marked correlation between isy-1/control vs. CW/control strongly supports common genetic regulation of additional unidentified transcriptional regulators that control zip-10 rather than direct causal regulation of isy-1 by CW. […] 1) In this study, the authors have used cold-shock and sequent warm-up as an experimental system to assay a cold-warm stress response. In this experimental set up, both phases, cold and warm, are important, and can have distinct molecular and physiological changes related to organism survival. In fact, as shown in Figure 3E and 3G, the protein levels of ZIP-10 show very different dynamics with different duration of cold shock and warm-up. It seems that ZIP-10 levels won't be induced without warm-up. Is this true? So which phase does zip-10 play a crucial role in regulating organism responses and survival? How about asp-17? The authors should consider characterizing the dynamic changes of zip-10 and asp-17 during cold shock and during warm-up. Thank you for the comments and raising these important questions for us to clarify. Yes, it is true that neither asp-17 nor zip-10 levels are induced unless with warm-up (Figure 1E and new Figure 4G). Our data indicate that their induction require both cold and warm phases but it is during the warm phase that the genetic program comes to play in regulating organismic response and survival. This is also consistent with the notion that very severe hypothermic stress actually arrests most of cellular activities, as discussed in the Introduction in the context of rationale why we chose to use cold-warming rather than simply cold shock as the stress paradigm. In the revised manuscript, we have clarified this issue by additional discussion and also provided additional experimental characterization of the dynamic ranges of zip-10 and asp-17 regulation during CW (please see Figure 1E, Figure 3G and Figure 4G). We performed new RNA immune-precipitation experiments and found that the zip-10-regulating mir-60 binds to ISY-1 directly and levels of mir-60 bound to ISY-1 were slightly but significantly increased by CW (new Figure 4A-4D). ZIP-10 is transiently induced by CW, has constitutively high baseline level and is further induced by CW in isy-1 mutants, indicating that isy-1 gates zip-10 expression via mir-60, while not responsible for triggering the transient induction of zip-10 by CW. We also performed new experiments to examine effects of increasing warming time on zip-10 induction (new Figure 4G). As predicted, isy-1 RNAi-treated animals exhibit relatively high ZIP-10 levels under baseline conditions and even more pronounced ZIP-10 up-regulation upon CW. However, ZIP-10 levels did not stay on over extended increasing warming time likely because of residual mir-60 functions as reasoned above and/or additional post-translational mechanisms promoting degradation of ZIP-10. Please see the above response to Point 1. Our previous and new data strongly indicate that CW but not other stress including hypoxia up-regulates zip-10 transcription, leading to up-regulation of asp-17 transcription, whereas ISY-1 regulates zip-10 (and thereby asp-17) via binding and processing of mir- 60, thus gating (permissive) but not triggering (instructive) the induction of zip-10 in response to CW. Like asp-17, zip-10 is exclusively expressed in intestine, based on our promoter-driven GFP reporters (Figure 3—figure supplement 2A) and single cell RNAseq data recently published by the Waterston lab (Cao et al., 2017), supporting cell-autonomous regulation. We have attempted to generate several arrays of ectopically over-expressed ZIP-10::GFP fusion constructs at varying concentrations to visualize its subcellular localizations but were not able to obtain viable animals, likely because of its toxicity, consistent with a role in promoting phenoptosis. Immunostaining of the low-copy FLAG-tagged ZIP-10 in single animals did not yield sufficiently strong specific signals for resolving cellular localization. However, we were able to use Western blot to obtain evidence of ZIP-10 abundance change and nuclear accumulation because of increased animal numbers (>100/per blot) for the Western blot assay. We performed new experiments and statistic calculation indicates that daf-16 slightly decreased the tolerance of zip-10 mutants (p = 0.0464, unpaired t-test, n=3 independent assays for N>30 animals for each group) whereas hsf-1 more pronouncedly decreased the tolerance of isy-1 mutants (p = 0.0128, unpaired t-test, n=3 independent assays for N>30 animals for each group). These results suggest that ZIP-10 promotes phenoptosis in response to CW partially by antagonizing DAF-16 effects and that ISY-1 regulates broad programs of stress response including the HSF-1 pathway, consistent with pleiotropic effects of isy-1 mutants as indicated in the Model and discussed in the text. We apologize for the confusion due to inadequacy of our description – Figure 4F is based on organismic death rate under non-CW stressed conditions to assay effects of zip-10 overexpression. We have now further clarified this in the Figure legend. Nonetheless, we agree with this reviewer’s reasoning that isy-1 mutants are more resistant to CW stress likely because of baseline induction of many DAF-16 and HSF-1 targets that can help cope with stress, as now discussed in the text. Thank you for the comments. Regarding mechanistic understanding of how ISY-1 regulates ZIP-10, we have performed new experiments and explored the connection of ISY-1 to mir-60, as suggested by the reviewing editor, and found indeed ISY-1 binds directly to the primary transcript of mir-60, based on RNA immune-precipitation of mCherry-tagged ISY-1, followed by QPCR quantification. Furthermore, mir-60 mutants exhibited elevated expression of zip-10 (and thereby asp-17) and reduced cold tolerance (new Figure 4A-4G and Figure 5H), thus linking ISY-1 to ZIP-10 mechanism of regulation. Human ISY1 has been shown to be important for processing of certain primary microRNA transcripts (Du et al., 2015). We suggest that ISY1’s role in microRNA processing is conserved in metazoans and identify a specific microRNA target that is important for organismic response to CW. Thank you. We have corrected it. We agree in vitro DNA binding would support our in vivo ChIP results. Given the 16 predicted highconfidence ZIP-10 binding motifs in the asp-17 promoter, there is likely redundancy of ZIP-10 binding and their comprehensive dissection will be substantial work beyond the scope of this study. Given the strong genetic causality evidence and correlative ChIP results, we conclude that ZIP-10 is required for asp-17 induction by CW but have toned down the specific roles of the predicted ZIP-10 binding motifs. Thank you. We have corrected it and modified the discussion. Thank you for the suggestion. We have performed the experiment and found that ectopic cpr-3 overexpression also led to enhanced death rates as asp-17 did, supporting a phenoptosis program activated by zip-10 (p < 0.001, unpaired t-test, n=3 independent assays for N>30 animals for each group). However, unlike viable asp-17 null allele mutant, deletion of cpr-3 by ok1788 homozygotes caused mildly Unc and mid-larval arrest phenotype, precluding us from assessing its physiological role in cold tolerance. As such, we focus on analysis of asp-17 rather than cpr-3 in the current study. Thank you for the comments. The paper by Kato et al., 2016 inadvertently omitted in our initial submission (thank you for bringing this to our attention) proved informative in suggesting a candidate ISY-1 target microRNA mir-60. We have since performed new experiments and explored the connection of ISY-1 to mir-60, as suggested by the reviewing editor, and found indeed ISY-1 binds directly to the primary transcript of mir-60, based on RNA immune-precipitation of mCherry-tagged ISY-1, followed by QPCR quantification. Furthermore, mir-60 mutants exhibited elevated expression of zip-10 (and thereby asp-17) and reduced tolerance of CW, thus linking ISY-1 to ZIP-10 regulation both mechanically and functionally. Human ISY1 has been shown to be important for primary microRNA processing (Du et al., 2015). We lend support to this notion and in this work further identify a specific microRNA target that is important for organismic response to CW. We conclude that the ISY-1/mir-60/ZIP-10 trio constitutes 3 major players of the novel and likely conserved pathway controlling animal adaptation and response to CW. Thank you for raising this important point. We have since confirmed by QPCR that mir-60 is indeed downregulated in isy-1 mutants (new Figure 4D). Given our additional new results showing direct binding of mir-60 to ISY-1 (new Figure 4A and 4B) and the established role of human ISY1 in small RNA processing, we have performed a small-scale candidate RNAi screen and found indeed RNAi against small RNA processing enzymes e.g. dcr-1 caused asp-17p::GFP activation, likely also because of defective mir-60 processing. We note, however, such RNAi phenotype cannot directly resolve the issue of the specificity of ISY-1 in regulating microRNA; in fact, we found that isy-1 mutants, unlike dcr-1 mutants, exhibited down-regulation of only a selective subset of microRNAs including mir-60 while many microRNAs were actually up-regulated (Figure 4—figure supplement 1). We are collaborating with a small-RNA biochemistry group to characterize how ISY-1 affects small RNA processing specifically for certain microRNA members e.g. mir-60 and will describe results of such biochemical findings on specificity in a future rather than current genetic study focusing on roles of ISY-1/mir-60/zip-10. Thank you for raising this interesting question. Expression profiling of a more recent paper (Wong et al., 2007) found indeed up-regulation of asp-17 by three different pathogens, E. faecalis, E. carotovora, and P. luminescens, but their fold induction is relatively moderate (1.84, 1.40, 1.62, respectively) as compared with those by CW or isy-1 mutations (10~50 fold induction). Compared with zip-10, another bZip gene zip-2 is much more robustly induced by various pathogens with established causal effects (Estes et al. 2010; Shapira et al., 2006). Our results thus support a central involvement of ZIP-10 in the CW response but do not rule out the possibility that ZIP-10 and ASP-17 are also involved (perhaps less prominently) in pathogen response that remains to be resolved in future studies. We focused on zip-10 because its deletion or RNAi can completely abolish asp-17p::GFP induction upon CW or in isy-1 mutants (Figure 3) and thus plays a key role in the pathway and biology of interest of current paper. 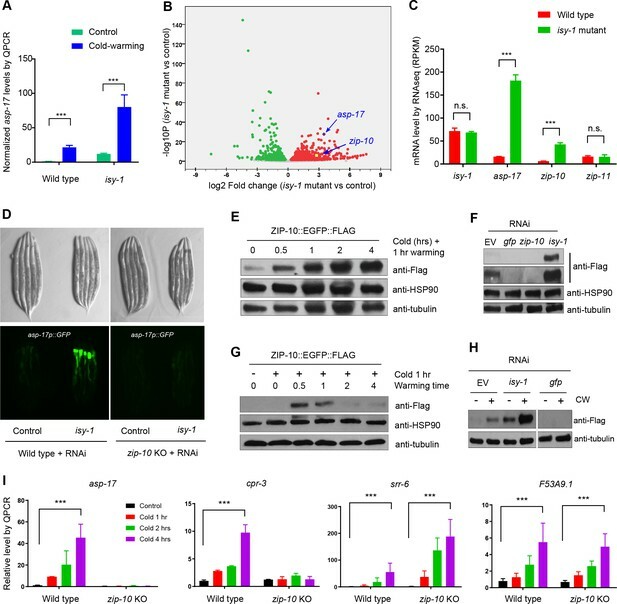 RNAi against other TFs did not have effects in asp-17p::GFP induction by CW or in isy-1 mutants. We agree that ISY-1 likely also regulates other TFs that are involved in processes e.g. pathogen response but unfortunately, we do not have the required biosafety permission yet to perform direct pathogen including Pseudomonas aeruginosa experiments in our laboratory. […] 1) CW and ISY-1 regulate zip-10 predominantly at the transcriptional level. Because microRNAs can function in the cytoplasm to downregulate targeted mRNAs or inhibit translation, mir-60 may not directly prohibit the transcription of zip-10. It would be of interest to discuss this potential for post-transcriptional regulation in models of of ISY-1and mir-60 may regulate zip-10. Thank you for the suggestion. We agree and have added discussion texts about the potential mechanisms by which ISY-1 and mir-60 regulate zip-10, indicating that such regulation of zip-10 is primarily transcriptional based on evidence in this study; further studies are required to discern to what extent mir-60 might possibly act at the zip-10 locus or more indirectly impact the transcription of zip-10, e.g. by post-transcriptionally inhibiting translation of a transcriptional activator of zip-10. We have used the standard percent input method to measure the RNA-IP signals (https://www.thermofisher.com/us/en/home/life-science/epigenetics-noncoding-rna-research/chromatin-remodeling/chromatin-immunoprecipitation-chip/chip-analysis.html). Samples from each condition exhibit comparable levels of total proteins and ISY-1::mcherry, which was not changed before and after CW based on WB, and were immunoprecipitated by equal amounts of RFP-Trap beads. Thank you. We have added the legends. Thank you. We have accordingly added experimental details and statistics. In Figure 5—figure supplement 2C, we compared the induction of ZIP-10 at different developmental stages and found indeed ZIP-10 is more prominently induced at adult than larval stages, consistent with the enhanced phenoptosis-promoting effect of ZIP-10 in older animals as shown in Figure 5—figure supplement 2D. However, ISY-1 is rather ubiquitously expressed and its RNA or protein level does not appear to be regulated as shown in Figure 2 and Figure 2—figure supplement 2E. 6) In the Materials and methods section, the RNeasy Mini Kit from Qiagen was used to purify total RNAs which are usually longer than 200 nt. How small RNAs were isolated for library construction and deep sequencing needs clarification. Endogenous siRNAs were missed from the Figure 5—figure supplement 1, suggesting that the 5'-dependent method was used to sequence the small RNA library. We are sorry for the confusion due to inadequacy of our description. In the methods section, the RNeasy Mini Kit from Qiagen was used to prepare total RNA for RNA-seq and QPCR studies. For small RNA sequencing, total RNA was isolated by the Quick-RNA MiniPrep kit (Zymo Research, R1055) that yields total RNA including small RNAs ranging 17-200 nt. We identified endogenous siRNAs in our small RNA-seq datasets but the numbers of reads were small and thus classified as others in Figure 5—figure supplement 1. We have revised the method section to clarify these issues. Thank you for the suggestion. We have changed the colors for different bars and indicated p-value significance levels. Given this reviewer’s concern, we have re-performed the experiment and found once again the zip-10 level is still slightly higher in the mir-60; zip-10 double than in zip-10(ok3462), indicating that zip-10 is up-regulated by mir-60 deletion while ok3462 likely does not fully delete zip-10. This interpretation is consistent with the model in which mir-60 genetically inhibits zip-10. We thank the Caenorhabditis Genetics Center, National BioResource Project in Japan and the Million Mutation Project for C. elegans strains. The work was supported by NIH grants R01GM117461, R00HL116654, ADA grant 1–16-IBS-197, Pew Scholar Award, Alfred P Sloan Foundation Fellowship, and Packard Fellowship in Science and Engineering (DKM), R01AG032435 (YW) and a CPSF postdoctoral fellowship (WJ). © 2018, Jiang et al.